Since the genesis of the ZetaTalk saga in 1995, a growing army of ZT fans have pointed out the countless occassions where the Zeta responses, replying to inquisitive Humans and speaking to a myriad of subjects, are later proven to be correct. ZT Newsletter, or Ning archives. But he has been a frequent target of President Donald Trump's criticism. Senate hearings for Mr Barr's confirmation are scheduled to begin on 15 January. 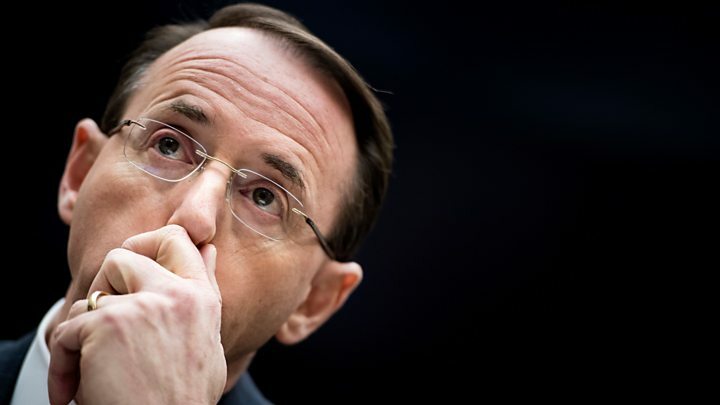 There is no set timeline for Mr Rosenstein's departure, according to US media. "My guess is that he is making room for the new attorney general to build a team that he wants around him," she added. Former Attorney General Jeff Sessions recused himself from overseeing Special Counsel Robert Mueller's inquiry into suspected Russian meddling in the 2016 presidential election. Republican Senator Lindsey Graham said after the two men met, Mr Barr had disagreed with the president's assertion that the Russia probe is "a witch hunt". White House adviser Kellyanne Conway said Mr Rosenstein will not immediately leave so that he can "help with the transition with bringing the new attorney general in. "We hope that that happens relatively soon," she said, adding Mr Rosenstein that has "done a great job". Mr Rosenstein denied the report, which he said was "based on anonymous sources who are obviously biased against the department". 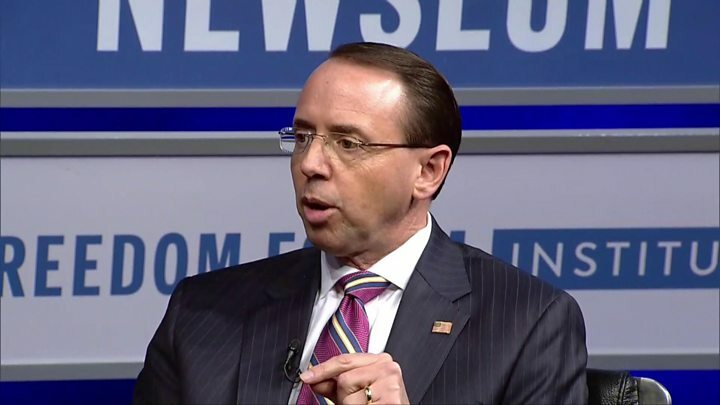 A US Department of Justice official later told the BBC that someone "who was in the room" and heard Mr Rosenstein's secret recording suggestion had considered it to be a joke. 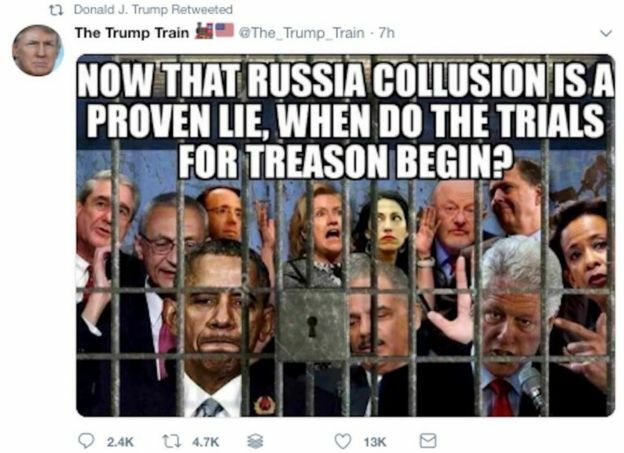 Media caption US Deputy Attorney General rails against "threats"
The post suggested that he had committed "treason". Mr Trump has repeatedly railed against the special counsel's probe into claims that Russia sought to influence the election in Mr Trump's favour. He has accused the investigation of being led by "Democrat loyalists". "16 November, 2017. 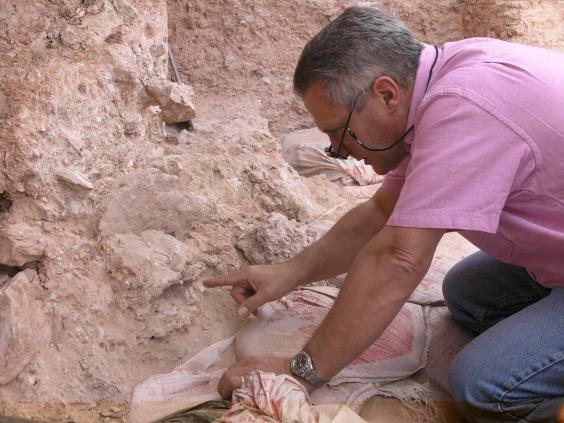 A 260,000-year-old skull from China could rewrite the history of human evolution. A new analysis has found the skull is remarkably similar to the earliest known fossil of our species,found 6,200 miles (10,000 km) away in Morocco in June. This suggests modern humans aren't solely descended from Africans as scientists previously thought. "7 December, 2017. <...> The analysis, published in the journal Science, reviews the plethora of new discoveries being reported from Asia over the past decade, which were made possible by technological advances and interdisciplinary collaborations, and shows that Homo sapiens reached distant parts of the Asian continent, as well as Near Oceania, much earlier than previously thought. Additionally, evidence that modern humans interbred with other hominins already present in Asia, such as Neanderthals and Denisovans, complicates the evolutionary history of our species. 6 October, 2017. "While it's not the first time we have observed the BLS manipulate data (the last time was in "This Is What Happens When The Bureau Of Labor Statistics Is Caught ..."), never before had we actually caught the Bureau Of Labor Statistics openly fabricating data. Until now. Of course, if the BLS confirms that this was a transposition fat finger error, it would also imply that the August number is in fact, the September data, a rather massive mistake which today has had a impact on trillions dollars worth of assets. Source: BLS"
The 'official' unemployment numbers for the USA stand at 4.9 percent. This is hard to believe for anybody who's keeps an eye on the economy. Would the Zetas say these numbers are much higher and have been increasing dramatically over the past few years? because it feels like it's being under-reported. "The USGS continues to downgrade magnitude to the point where at present quakes can be listed at almost two points below their actual magnitude." A building collapsed Friday night in Egypt’s capital Cairo leaving at least nine people injured. The collapse occurred after a 3.3 magnitude earthquake. According to the USGS magnitude/intensity comparison, a 3.3 quake should have only resulted in "vibrations similar to the passing of a truck." Damage from the March 24, 2017 Cairo quake was at a minimum equivalent to a mid-range magnitude 5: "considerable damage in poorly built or badly designed structures". EMSC reported the quake as a magnitude 4.3 mb. The Philippine Institute of Volcanology and Seismology (Phivolcs) on Thursday has already recorded 716 aftershocks after a magnitude 5.1 earthquake rocked Batangas province on Tuesday, April 4. There is growing evidence that, prior to his tragic death in June 2013, award-winning investigative journalist Michael Hastings had been looking into material that formed part of what WikiLeaks would eventually publish as the CIA ‘Vault 7’ documents. Other evidence indicates that Hastings may have come upon a secret hacking organisation set up by the CIA, that is also referenced in ‘Vault 7′. Fellow journalist Barrett Brown, meanwhile, continues to raise serious questions about Hastings’ death. Michael Hastings’ article in Rolling Stone brought down General Stanley McChrystal. And he exposed the dealings of General “King” David Petraeus, former commander of US Central Command (CENTCOM), the International Security Assistance Forces (ISAF) in Afghanistan, and later head of the CIA. There were also many other prominent stories. But Hastings was working on one “big story” in particular. Before he could investigate further, however, Hastings died in a car crash. In the immediate aftermath, there was much speculation about the crash and the precise circumstances, with one eyewitness claiming he saw sparks coming from the car before it blew up. But the police asserted there was no foul play. There is reason to believe that intelligence agencies for major powers — including the United States — know how to remotely seize control of a car. 12 hours before the crash, Hastings had sent an email to colleagues at BuzzFeed and said: “I’m onto a big story, and need to go off the radat [sic] for a bit”. Three hours before that, he had made contact with WikiLeaks lawyer Jennifer Robinson. Evidence of murder unfortunately has been lost. Just what caused Hasting’s car to jack sideways and burst into flames is unlikely to ever be proven, definitively, because the car and many of its working parts have been destroyed by fire or shattered by the impact against the tree. But several facts point to murder. Hastings was speeding, as though running from a threat, at an odd hour – 4:25 am. The car suddenly jacked sideways, indicating a mechanical problem that would affect the steering. Else did it hit a pothole in LA? And the car burst into flames, an unusual result in modern cars where the tank is under the rear seat, especially when the car is not hit from the side but from the front. But this is something a bomb could arrange. Hastings was murdered, an end he frankly expected at some point due to his aggressive investigative reporting. He could not be threatened or bribed, nor would he take subtle hints or modify the truth by omissions to avoid confrontations with those in power. He received a warning, and thus at an odd hour was trying to change locations, fleeing. His car had been tampered with so the car would accelerate and then torque sideways to crash or flip, timed to be accompanied by a bomb that caused his fiery death. What was he working on that his death was arranged at this time? Given his track record, he was unlikely to back away from the inside stories on the cover-up over Nibiru. He was thus silenced before the stories could break. "We warned at the start of ZetaTalk, in 1995, that unpredictable weather extremes, switching about from drought to deluge, would occur and increase on a lineal basis up until the pole shift." California just entered its fourth year in drought. Experts say it's the worst the state has seen in 1,200 years. The state's snowpack, which typically provides about a third of the water for its farms and residents, remains at its lowest level in history. A section of Lake Oroville was nearly dry in August 2014, when it was at 32% of its total 3,537,577-acre-foot area. Reservoir banks that were once underwater at Millerton Lake on the San Joaquin River in Friant, a town just north of Fresno in California's Central Valley. Large swaths of the region are on track to experience their wettest winter on record, with many areas having already surpassed their average precipitation for an entire year. And all that water is putting new strains on the network of dams, rivers, levees and other waterways that are essential to preventing massive flooding during wet years like this one. As the site of the nation’s tallest dam and the main storage for the State Water Project that sends water to the Southland, Lake Oroville has commanded national attention as the crippled spillways forced the evacuations of nearly 200,000 downstream. But smaller water systems are also under intense pressure. Sixteen reservoirs, ranging from small to the biggest in the state, were above 90% full as of February 15. Among them is the Don Pedro Reservoir, the sixth-largest in California and located near Yosemite National Park. As of Wednesday afternoon, it stood at an elevation of 827.4 feet, just shy of its 830-foot capacity. "VL has been fortunate enough to work with some awesome people! We have loyal and awakened followers who help bring us information, and we also have trusted insiders, whistleblowers and leakers who trust us enough to give us information, too. Today, we have an exclusive interview with a special DHS insider who has answered some critical questions we have on PizzaGate. Our insider prefers to call it PedoGate and what he told us blew our minds!